For the first time since we met the navigation bar, Android has a whole new way to get around. Android 9 Pie introduces a new series of gestures designed specifically for navigation, and they bring some wholesale changes to the way we launch, switch, and quit apps. When you install Android Pie on your phone, your navigation bar will look the same as it always has, with a back, home, and overview button at the bottom go the screen. That’s because the new system is optional, at least for now. To try Gestures out, you need to turn it on. You can find the toggle in the Settings app. Open System, then Gestures, and tap Swipe up on home button. Inside you’ll find a solitary toggle with the same name. Flip it blue and the navigation bar will change to a pill-shaped home button and a thin back arrow. Android Pie introduces a brand new Overview screen that’s quite a big change from the one in Oreo. First and foremost, it’s arranged horizontally rather than vertically, so you need to swipe right rather than up to see your recent apps. There’s also a bar that lets you search your phone and the web as well as five suggested app icons at the bottom of the screen. You don’t need to have gesture navigation enabled to use it, but it’s clearly designed for the new navigation. While it takes some getting used to, the system is mostly an improvement over the old method. Most Android phones, especially premium ones, dumped their home buttons long ago, and the virtual buttons on the navigation bar always seemed like a crutch. The gesture-based navigation on Pie is fluid and natural, and the gestures are all intuitive. My only complaint is that you can’t swipe to go back a screen so you still need to use the back button. 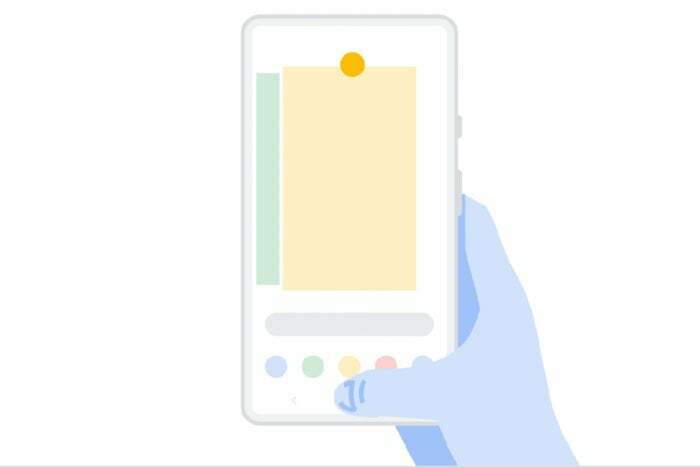 But otherwise, gesture navigation on Android Pie is a refreshing change and it should lead to some cool tweaks from other phone manufacturers as they adapt the system to their own interfaces and designs. 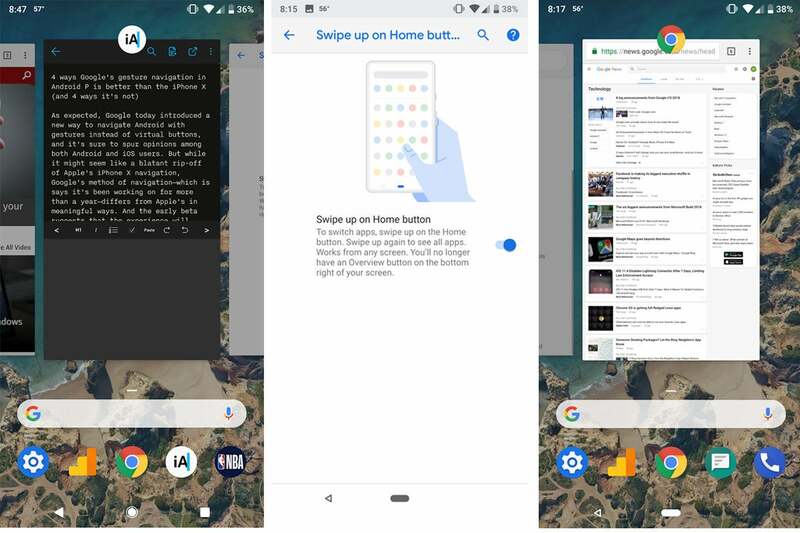 Google’s new gesture-based navigation in Android P is entirely optional and easy to switch on and off. But the best thing about Gestures is that it’s optional. Even as it’s gotten more closed, Android’s biggest advantage over iOS is that it allows users to customize and personalize it to their liking, and the new navigation system is no exception. If you still want the classic nav bar, just keep Swipe up on home button turned off and you’ll be able to navigate just like you did before. But with the new Overview screen and the relentless push by phone makers to eliminate bezels altogether, Gestures make a lot of sense. I suspect it’ll be the default navigation on Android Q.
Google introduced Multi Window for phones back on Nougat, but the method was a little convoluted. When in the Overview window, you needed to tap and hold on a window and drag it to the top of the screen to initiate Multi Window and then tap a second window to launch them together. In Android Pie’s new Overview screen, it’s a whole lot lot simpler. To start Multi Window, long-press on the icon above the screen to bring up the menu, and select Split Screen. Then simply tap a second screen to launch the two windows side by side. And when you’re ready to go back to single app view, simply drag the handle all the way to the bottom of the screen. If you want to quit an app, the method is a little different thanks to the new multitasking carousel. You don’t swipe left or tap a little X—you simply swipe up on a screen until it disappears. And if you need to force stop or uninstall an app, long-press on the icon above the window and select App info. You’ll need a Pixel phone to take advantage of this, and it’s such a great feature you might want to run out and buy one just to use it. When you’re in the Overview screen, you’re free to copy anything you can see. Just tap and hold on a picture or a portion of text to select it. Then you can either copy it to the clipboard and bring it to another app or tap Share to bring up the sharing menu. You probably noticed that there’s an empty space to the right of the home button in the new gesture navigation bar. That’s because it can be filled with icons as they’re needed. When you have auto-rotate turned off, for example, a small rotation icon will appear when you turn your phone to let you temporarily change your orientation. And if you have more than one keyboard installed, a keyboard icon will appear when the keyboard is being used to let you easily pick a new one.